Today I am going to review one of the most talked about foundation- REVLON PHOTOREADY FOUNDATION. I know most of the people have already bought this , used this & even reviewed it but still I think its always less , the more you review best products. WHAT REVLON PHOTOREADY FOUNDATION CLAIMS? The packaging of this Revlon Foundation in a pump bottle makes it super convenient & super hygienic to use.In India , we get very few foundations which comes in pump bottles & that too are of the international brands. 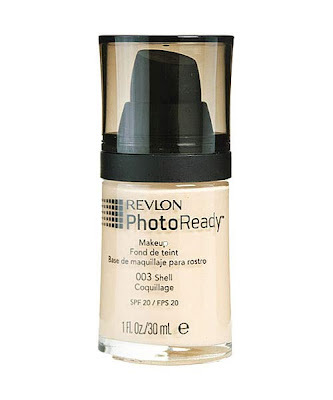 Take a look at the bottle of Revlon Photoready Foundation. Now on application , the foundation blends easily , but a little less easily than Revlon New Complexion Liquid Foundation. It blends easily covering lot of flaws on face including pimples , acne scars etc to quite an extent. The foundation has got some shimmer particles in it as you can see in the picture below , I have applied the foundation on the right side. However these shimmer partciles dont appear shimmery on face, its because of this shimmer , the face look glowy. Overall I woud say REVLON PHOTOREADY is a good to go foundation , best for parties , glossy look , adds glow to face but would not work alone if you have major flaws. In that case you might have to use a concealer. Although it claims to be giving flawless & poreless skin, but i dont think it stands on any of the claims either if one has major flaws & open pores. Out of Revlon Photoready & Revlon New Complexion Foundation , i would go for new Complexion one. 2- 3 drops required to cover whole face. Easily stays on face for 4 -5 hrs. Very nice blog :-) Positive Fountain, that's me following. Nice review! This sounds like a pretty good quality drugstore foundation, and i'm loving that it has a pump!